Debre Damo is the name of a flat-topped mountain, or amba, and also the name of a 6th century monastery in northern Ethiopia. It is located west of Adigrat in the Tigray Region of the country. The mountain is a steeply rising plateau of trapezoidal shape, about 1000 by 400 meters in dimension, having a latitude and longitude of 14�22'N 39�17'E 14.367�N 39.283�E Coordinates: 14�22'N 39�17'E 14.367�N 39.283�E and an elevation of 2216 meters above sea level. 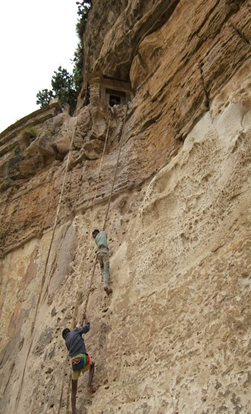 The monastery, accessible only by rope up a sheer cliff, is known for its collection of manuscripts, and having the earliest existing church in Ethiopia. Tradition claims the monastery was founded in the sixth century by Abuna Aregawi, who is a Saint and believed to have been lifted onto the cliff top by a giant serpent. According to the legend expressed in a number of the paintings, the Archangel Gabriel stood by with a sword ready to slay the snake if it attacked Abuna Aragawi. It did not, however, and wrapped in its coils and the Saint reached the top safely, dropping his cross on a stone, which is today kissed by all who enter the monastery.